The sixth annual Collaborating for Education and Research Forum will gather STEM (Science Technology Engineering and Math) education and research professionals from 8:15 a.m. to 2 p.m. Saturday (Feb. 23) in the Jordan Hall of Science at the University of Notre Dame. Educators will learn about the strategic plan for the new Michiana Science and Technology Center, as well as additional STEM education and research opportunities for students and educators. The forum promotes interaction among K-12 teachers and administrators; university faculty, graduate students and staff; and local industry specialists in science, technology, engineering and mathematics. The event showcases a broad spectrum of professional engagement opportunities for K-12 educators. All of the engagement opportunities are free to educators, while some programs also provide stipends. 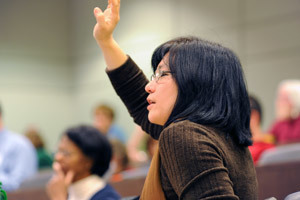 Teachers earn State of Indiana professional growth points when completing these programs and when attending the forum. The Collaborating for Education and Research Forum is sponsored by Notre Dame and the National Science Foundation. Registration information is available online. Originally published by Marissa Gebhard at newsinfo.nd.edu on February 18, 2013.